In the case of a dot proof, the halftone screening of the final print is simulated in the proof. This screening shows possible moiré or other disturbing effects, that by dot proofing can be seen in advance on the proof. Two different variants are possible. Firstly, for the production of printing plates in the RIP screening, imposed 1Bit data files are combined in the proofing software and then proofed. Secondly, some proofing systems can simulate the printed screen without using real 1-Bit Data. Screen angle, dot form and LPI are then specified within the proofing system, and the system then simulates the printing screen. Perfectly suited for halftone proofing proofing systems are like the Kodak Approval system. Due to their high resolution, printing and proofing details are superior to common inkjet systems. Due to the high price in acquisition and in consumables, the long processing and laminating time and the small color gamut of these systems, they have never really got a large markt share outside of the US. In particular, in recent years the halftone proof is much less common in the Proof practice and can be found today mostly only in the range of proofs within a printing house. 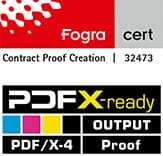 Proofing Service providers today mainly focus on inkjet proofs without screening, because they have much larger color spaces and lower the cost of a proof compared to systems such as the Kodak Approval lower by up to 90%. The higher modern printing screen and other screening methods such as hybrid screening and frequency-modulated screens also decreased noticeably the risk of unwanted Moiré-patterns in print during the last couple of years. The focus is now more on the color accuracy of the proof and the reproduction of spot colors, as in the simulation of dots and screening.